Leaving your pet at home is not an easy part of any pet parent’s day. Many pet parents have full-time jobs and other obligations that keep them away from the house for extended periods of time, which is simply a part of everyday life. However, pet parents should take caution in leaving their pet’s home all day. The length at which you should leave your dog at home is a matter of the individual dog. That being said, there are a few things to keep in mind when keeping your dog at home for extended periods of time: including, age of your dog, amount of exercise they are given, and overall behavior. Firstly, you should consider the age of the dog. If your dog is under 18 months, and they are still learning to be potty trained, you are more likely to set them up for potty training success if you are home frequently to let them out. If your dog is older, they might be more comfortable staying at home for long periods of time. Secondly, consider the amount of exercise you provide your dog both before and after leaving the house for the day. If your dog isn’t provided an opportunity to stretch their legs, they are more likely to be bored, destructive, or even obese. Lastly, if your dog is not yet used to you being away from the house, they might start to become destructive. If this is the case, you may have to start with being away for short periods of time and work your way up to being gone for a full day. This process will take a lot of patience and some creativity on your part. The best thing you can do is make your absence a positive experience by entertaining them with the following options. 1) Petcube: The Petcube is an awesome new pet camera that allows you to interact, talk and play with your pet while you are away. Their technology includes a two-way audio stream through a built-in microphone and speaker, and a laser pointer for entertainment. To learn more about Petcube, visit their website here. 2) Pet Tutor: The Pet Tutor is a smart wireless training game system for your pet. 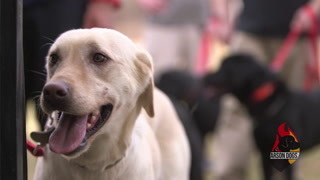 It gives you the ability to reward your dog for good behavior through the Internet. To learn more about the Pet Tutor, visit their website here. 3) Adopt Another Pet: If you have one dog at home and you believe that would benefit from the companionship of another dog or cat, you should definitely look into adding to your family. However, it is important not to use another pet as a treatment for your dog’s separation anxiety. 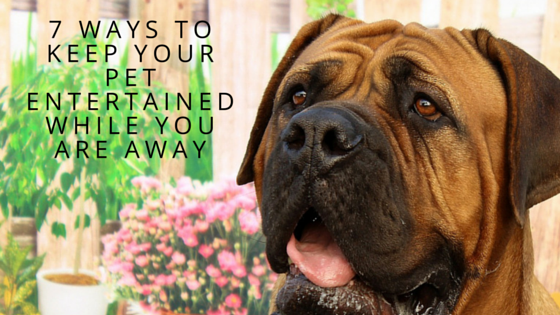 If your dog is suffering from separation anxiety, it is recommended that you work on this before getting another dog. 4) DogTV: DogTV provides your dog with entertainment while you are away. All of the programming is scientifically developed to provide the right company for your dogs. The content has been analyzed and research so that it is specific to a dog’s sense of vision and hearing. 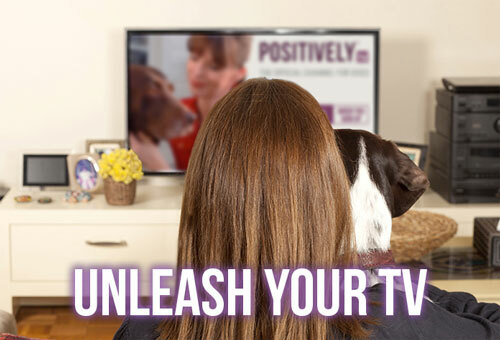 To learn more about DogTV, please visit their website here. 5) Soothing Sounds: Soothing music and sounds can have a calming effect on your dog. Why does sound have such an effect? Sound healers have studied the therapeutic nature of sound through the years. They have discovered that by adjusting the different relationships between tone, tempo, and pattern, one can alter breathe, heart rate, and brain waves. To learn more about sound therapy and calming music for dogs, please visit Through A Dog’s Ear. 6) Puzzle Toys: There is a myriad of puzzle toys available for dogs. Each of which challenges your dog mentally. Providing them with mental stimulation while you are away is just as important as providing them with exercise. 7) Self-Fetching Toys: These days technology is making not just our lives better, but our dog’s lives too! With new toys like the iFetch, your dog can play fetch all by themselves which will keep them busy for hours! Most importantly, your pet will be getting exercise even while you are away! If you are ever unsure about the amount of time you leave your pet at home, I highly recommend having a conversation with your veterinarian.